There was a time when I thought that nothing can be better for a computer than good speakers. But then they invented Skype and online gaming and neighbor’s full volume speakers that I need to keep away. At this point, we need the best computer microphones. Let’s start with a good brand and a good price. 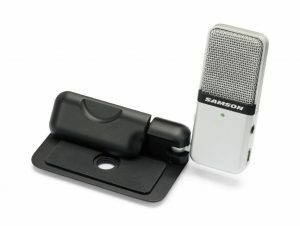 Samson Go Mic fits the parameters perfectly, in fact, the Go Mic often makes lists of best computer microphone mics for all kinds of users. It is truly a plug and play mic, which means you just need to insert it into your PC’s or Mac ‘s USB port, no drivers required. But it comes with a CD, check out what you can with the extra software. Compact, multi-purpose design contains high-quality components and meticulous engineering that ensure that Go Mic delivers clear audio reproduction. 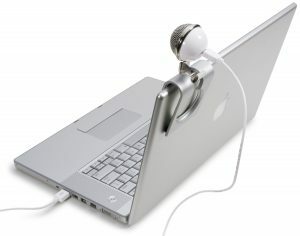 You can use it to record voice, and podcasts, videocalls (=Skype), just not the music. You gonna be surprised by its size as well – half the size of a deck of cards. On a sober note, I would have to admit that Samson Go Mic does not compare favorably with $400+ studio mics. May have a fixable trouble with Windows 10 installation. Floureon BM-800 is $100 mic you can currently get for $29. 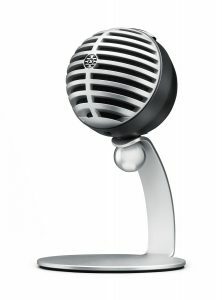 It is one of the best computer microphones in the cheap category. It’s your regular condenser mic with a shock mount to reduce mic vibration and extra noise. It barely troubles you with very low self-noise. That and cardioid pattern make it the choice for recording acoustic instruments, chats, and broadcasting. With 20 Hz – 20 kHz frequency response and a sensitivity of 45 dB plus\minus 1 dB, you will not get pro or even semi-pro recordings but you will get it done. BM-800 also comes with a removable foam cover to protect your source from interference. This is actually an excellent condenser microphone and it may even exceed the needs of an average user. Not suit for mobile phone and tablet computer. USB connectivity only through adapters. The Blue iCE also meets the parameters mentioned above and makes for a good competition for the Samson. 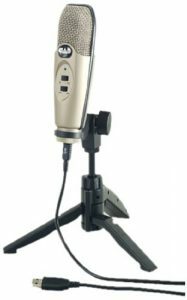 iCE is a great option if you are looking for a reliable, small and self-sustaining USB condenser microphone. Together with Go Mic, this is one of top picks for best budget-friendly computer mics. 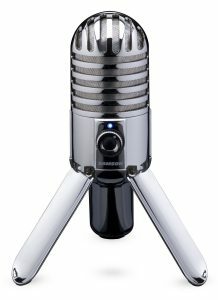 Cardioid condenser capsule offers sound quality for any purpose you use it for, from small-time chats to voice-over work. Specifications similar to Go Mic: a frequency response of 20 Hz – 20 kHz and sample rate of 44.1 kHz/16 bit ensure you get the needed range, and the recording quality supported by some blocking of ambient noise does the job of relaying your message and emotions. Unfortunately, it doesn’t have any controls on the unit and the polar patterns are not interchangeable, but this is certainly a good way to save your cash wisely. No interchangebility of polar patterns. We start the next level with another Samson level, the hi-tech rocket-look Meteor. And you can play with shiny foldable legs. And let’s impress you right away with Meteor’s one of the largest condenser diaphragms of 25mm in any USB mic available. Cardioid pickup pattern plus smooth frequency response plus 16-bit, 44.1/48kHz resolution give you audio results you gonna wanna call professional. Out of the box, you get a USB cable and a plug and play feature, so you can use it anywhere and on any device worth mentioning. Samson is simply great for the price and you can’t imagine it to start looking old. 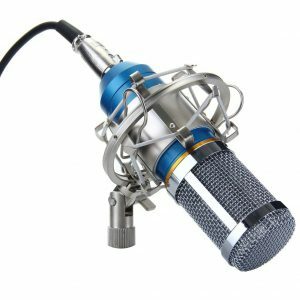 The versatile condenser microphone with a number of excellent features that make it one of the best computer microphones out there. Too bad the circle on the front is not a launch button, it’s just volume. Works with iPad using Apple’s Lightning USB Camera Adapter or Camera Connection Kit (30-pin). Stereo 1/8″ headphone jack for no latency monitoring. USB-connected gadgets work only as good as computers let them. The Shure Motiv MV5 is compatible with both PC and Mac computers via 1m USB cable, but also iOS and Android devices via out-of-the-box microUSB and Lightning cable. It has a removable desktop stand (on the photo), and a built-in headphone output for real-time monitoring. Custom-tuned microphone capsule offers superior audio with frequency range spanning up to 24bit/48 kHz. There are 3 handy DSP options everybody needs: Voice, Instrument, and Flat. Motiv MV5 is easy to carry around because it is lightweight. This retro-styled piece fits the $100 budget. Compatible with PC, Mac and Android. Automatically applies gain, EQ, and limiting. Retro design is not for everybody. A few pops & cracks here & there. Blue Yeti that looks more like a Yeti robot is just above $100. This could easily be the best affordable microphone on the market. 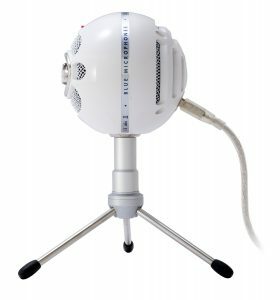 This microphone provides some near-studio recording quality due to its tri-capsule design and 4 pattern options – cardioid, bidirectional, omnidirectional and stereo. 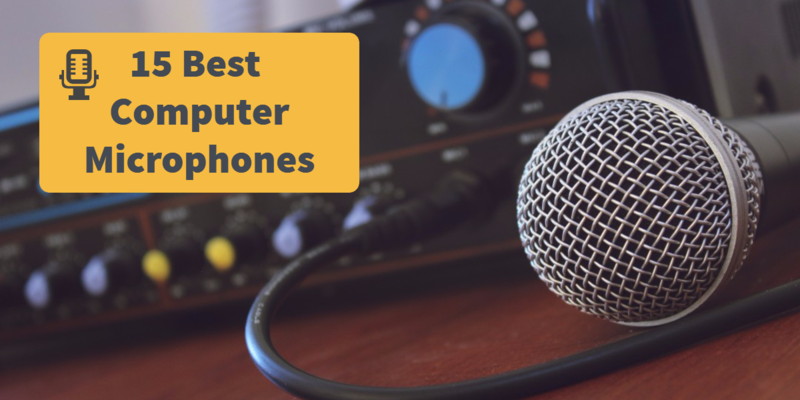 These fundamental features make it the best computer microphone because you can easily record podcasts, interviews, and even music as the mic adapts to your individual needs. Those buttons pretty visible on the pic are controls for the pattern selection, volume, mic gain and instant mute all on the front of the unit for some easy access. If you experience distortion or feedback while recording an especially loud source, simply adjust the microphone’s sensitivity with the gain control. Thanks to those robot legs with hinge hips, you can fold, pivot or adjusted the Blue Yeti. And I almost forgot to mention that this is a plug’n’play gadget, just don’t forget to plug it. You may need a shock mount if it is too sensitive for your environment. One of the USB mic bestsellers, Audio-Technica 2020USB is one of those things your friends already have. After all, Audio-Technica is one of the most famous brands. They do have a regular model without USB connection, but this is more convenient for most users. You can totally work the 2020 in a studio by mounting it via a mic stand and shock mount. 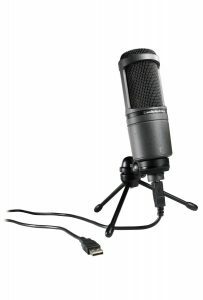 You get a side-address condenser mic, cardioid polar pattern, and excellent audio quality. And it does come with a small tripod desk stand that you see on the picture if you want it to use it on your desk. Audio-Technica 2020USB is a bit more expensive than the Yeti, but it pays off with better overall audio quality. But it can pick up ambient noises as well. You obviously should not put it next to your laptop’s cooler. Comes without any CD, so it depends on the computer to google up the driver. Rode NT-USB conveniently features a pop shield out-of-the-box as you can clearly see on the picture. 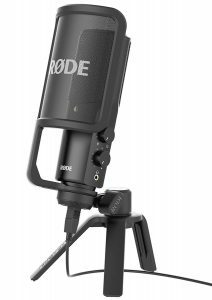 Rode is the ultimate creator of microphones and it’s the price that made Rode appear so late on this list. Their NTK model is perfect but it’s over $500 on a good day. So, NT-USB model offers us great build stability and overall sound quality. As it came out in 2014 you may still call it a new model and the USB connectivity makes it quite up-to-date. Naturally, it comes with the USB cable. The bunch of controls visible on mic’s body are dials to adjust the monitoring level and mix between the computer/iPad audio and the microphone input. You can scream into this mic as the SPL is 110dB. Frequency range is nothing new, though, at 20Hz to 20kHz. 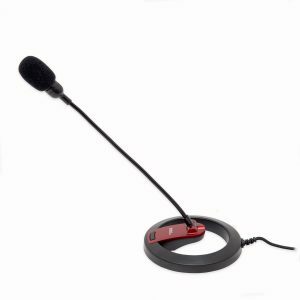 You are getting a top-quality USB mic here, if not professional one. Pop shield, Tripod desk stand, ring mount, storage pouch and 6m (20’) USB cable included. Resolution and frequency range are average for a good mic. 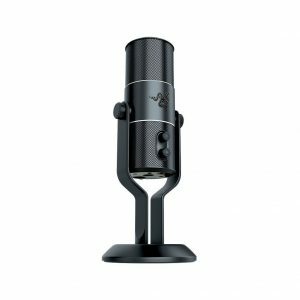 Going upwards to $200 but not there yet we should definitely stop for Razer Seiren Elite. We can’t skip a mic with a built-in headphone amplifier and no latency output. Razer is a gaming brand, that’s another reason a make the stop. 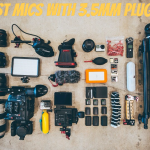 Besides the gaming acumen, this mic is able to cover our required necessities: wide range of uses, great audio quality, and USB connectivity. We can certainly appreciate the mic’s build with the built-in stand and aluminum stabilizing base which works for all kinds of surfaces. Hard to break as well. Not unlike the robo-Yeti above, the Seiren allows you to use 4 different polar patterns because of three condenser capsules inside. It comes with the surprisingly high sample rate of 192 kHz and 24-bit (the highest audio resolution in this guide). Add high-pass filter to cut off frequencies below 100 Hz and you get hardware better than the Yeti. Adjustable recording patterns.192 Hz sample rate. Can get almost the same performance for less cash. Apogee Electronics always means quality hardware. And the price for this one goes over $200. This is a studio-quality mic, no less, with eye-popping HD recording at up to 96 kHz\24-bit. Shortly put, if you are looking for a mic to record that way this is the way to go and get steady semi-pro sound. The range of applications is accessible with the MiC 96k’s combination of a microphone, mic preamp and an A/D converter into one compact plug-n-play device. Use the gain wheel to control how sensitive the mic is, if you switched on air-conditioner, fan and/or fridge and TV. Up to 96 kHz/24-bit HD recording. Can take time to work start working with Windows 10. Let’s take a break for a small travel mic. 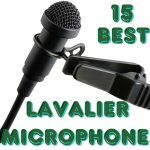 This is strong competition for the beginner of this list, the Go Mic. Blue Snowflake essentially offers the same thing: a small USB mic for traveling and clipping onto your screen. Great for the usual things, like podcasts, gaming, video calls and more. This is not the hardware we use words like “studio” and “professional” with. With Snowflake you travel and save money and space. This is just a cardioid condenser mic with the sample rate of the Go Mic at 44.1 kHz and 16-bit to bet the job done. The actual output is a Mini-A USB plug and the mic comes bundled with a 1-meter Mini-A to Type A cable. If you need a longer cable, they’re pretty cheap. No buttons to adjust the levels. CAD U37 is one of a few things under $40 to advise. At a lower price than mics above, you get a large cardioid pick-up pattern for good sound isolation, 10dB overload-protection to prevent distortion, and a bass-reduction switch to reduce room noise. Some users even record guitar music with it. You can toy around with the switches on the body. Position “0” works for recording strings or regular voice. 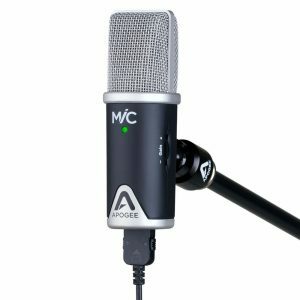 It does not offer sound or build quality quite equal to other USB mics on the list (mind the price tag), but this is the best alternative to save some money. You can even check out the short voice-over test on its amazon.com page. Connectland CL-ME-606 is a $8.40 feast for anybody’s wallet. It is considered to be the best option just for talking thanks to a sleek and durable design. 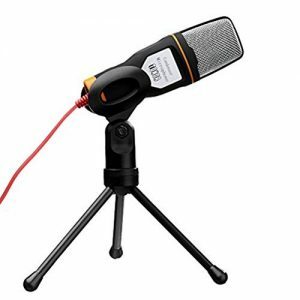 This omnidirectional condenser piece of microphone is also portable and simple to use. Plug-n-play via 3.5mm stereo plug that fits all desktops and laptops. You can unplug it and use with another device every few minutes without ever updating drivers or whatever. The ON/OFF switch feels excessive, I would just unplug it. With -38 dB +/- 2 dB sensitivity, S/N ratio > 60 dB and a frequency range of 100 Hz – 16000 Hz, the CL-Me-606 does what microphones always did: plugging to computers in a quick second and making other happy to hear you (or not). Does not relay the beauty of your voice entirely. For $14-40 hardware (depending on sales) the word “professional” should not be used, obviously. But Tonor TN12326 PROFESSIONAL certainly does its job and looks less of a hobo than CL-ME-606. So, TN12326 is an easy to use, portable condenser microphone. The 3.5 mm stereo plug makes the plug and play option a natural thing. On the down side, you will not find USB connectivity here. The cardioid pickup pattern and clear frequency response will deliver excellent quality of sound in a variety of applications, like voice calls, skype chat, and so on. The frequency response is not excellent at 50Hz -16KHz, but it will help to cut off some noise. The mic’s small and flexible head is also tiltable within 90 degrees and turns around 360 degrees. And you see a convenient mini tripod on the pic above. You need a place to put it. 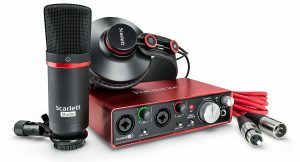 And we are finishing with a jewel of all microphones, The Focusrite Scarlett 2i2 Studio. As the picture shows, it is not even just a mic. This is a pile of hardware that you can really turn into a studio. 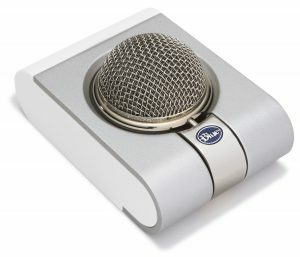 If you have mics that connect through a variety of interfaces this would be the perfect choice. 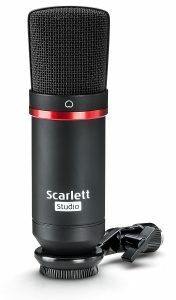 Once you have set it up Scarlett 2i2 will routinely and with high clarity deliver recordings of voice, instruments, and chats. If you are a beginner of studio work you will be lucky to start with this. This is where we mention the low latency and 20 Hz – 20 kHz frequency response, sample rates up to 192kHz / 24 bit, Novation bass station VST and AU plug-in synthesizer and seriously cool looks. In fact, it works great for showing off. 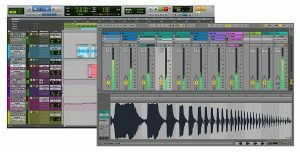 And you will be able to show off the quality recordings you make as well. While you play with it you will certainly get inspired to achieve more. Makes you feel stupid at first. Takes some space + cables take space too.